Jared Kane arrives at the SGC with word that his homeworld, Tegalus, again faces a global crisis. As the Rand Protectorate and the Caledonian Federation struggled to rebuild following the war, a Prior visited the planet. In exchange for embracing Origin, the Prior offered Rand a powerful satellite weapon, and now President Nadal has offered the Caledonians five days to surrender or be destroyed. Fearful of a return to global destruction, Jared pleads for SG-1's help to destroy the weapon. Daniel proposes diplomacy as an alternative, but when he and Jared return to Tegalus, they are promptly arrested for treason. Aboard Prometheus, SG-1 approaches Tegalus, intending to destroy the weapon. However, as the satellite powers up, and Prometheus fires a preemptive strike, the weapon returns fire, easily piercing the ship's defenses and causing Pendergast to order an evacuation and offer his surrender. Instead, Nadal orders the ship's destruction, and those who had not escaped are lost as Prometheus is annihilated. Remnants of the Prometheus crew are reunited in Caledonia, and Carter proposes an alternate approach to Minister Chaska. An EM pulse would disable communications and allow an F-302 a second chance to destroy the weapon. With communications disabled, Rand's satellite is vulnerable, and Mitchell and Teal'c, in an F-302, prepare to fire. However, Daniel makes a final attempt at a peaceful compromise. In exchange for leaving the satellite intact, Rand will offer Caledonia the stargate and the option to evacuate their world. Chaska calls off the attack to consider the offer, but when power is restored, Nadal orders the destruction of the Caledonian capital. Only when his own officers revolt and Nadal is killed, is the weapon shut down. 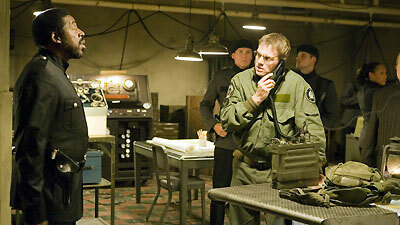 Soon after SG-1 returns home, however, war ignites between the enemies once more. The stargate is presumed buried in the rubble. When the Prior visited Tegalus, President Nadal and the people of the Rand Protectorate accepted Origin. Prime Minister Chaska and the people of the Caledonian Federation refused. Jared Kane became a senator of the Rand government. Leda Kane refused to embrace Origin and died from the Prior plague that had swept across Rand. In the Rand attack, both Prometheus and Colonel Lionel Pendergast were lost. Of the 115 people on board, 76 survived.